I first came across the idea of teaching Yoga to prison inmates when I was staying in an ashram in the northern parts of Bihar, India. I had traveled there without much prior knowledge of why I was really going there, what I was in for, or how it had even happened so easily, and so quickly in my life. But it had! I had been attending some Yoga classes in Mt Eden, Auckland for a couple of years with a Satyananda yoga teacher before I met Swami Muktidharma who is based in Golden Bay. I attended a weekend yoga retreat with Swami Mukti and he said to me ‘You should come to India’……and I said ‘OK’ without even hesitating. I had felt during that retreat that there was ‘something’ different happening here….but I couldn’t put my finger on it…I couldn’t explain what it was. I just knew deep down there was this ‘something’ feeling. Six months later I had quit my job as wardrobe assistant for Xena Warrior Princess, left my boyfriend, flat and friends and there I was! Studying Yoga for 4 months at the world’s first Yoga University – Bihar Yoga Bharati. Admittedly – I was in way over my head. I had no idea what I was doing. I knew nothing about what an ashram was or what a guru was, and that there was even one living there! All the orange robes, and shaved heads, karma yoga, cleansing practices, eating with your hands, and the weird chanting made me giggle! If only some of my friends could see me now! It all felt strange, yet there was still that ‘something’ that felt really good, and really safe. And I actually didn’t care what my friends thought …. I knew it was real, and deep and untouchable. I had a hard time there, for 4 months I was actually quite depressed and wanted to escape back home, or at least to the OUTSIDE. I constantly fantasied about lasagne and apple crumble. We were allowed a pass out of the ashram once a month. I was dealing with cold showers, hard beds, periods of silence, simple food, no freedom, no movies, no TV, no books (except spiritual) and generally feeling completely out of my depth. So – I threw myself into my yoga studies. Living and breathing yoga with a true living master Swami Niranjanananda Saraswati. It was especially difficult when I got Hepatitis A and had to stay in bed for 6 weeks. I didn’t understand why the Swamis’ laughed delightedly at me that I was so sick and told me how lucky I was. Then it was explained to me that the sicker you are, the deeper Samskaras (past impressions and karmas) you are likely to be burning. Ok…great! Well at least I was getting something out of my system. Whatever that was! I learnt to see illness in a positive sense, rather than negative. This was an amazing transformative process, as it allowed me acceptance and deep healing. I was fortunate to have an amazing asana and pranayama teacher who one day gave a 60 minute lecture on teaching Yoga in maximum security prisons in London. In that talk she admitted that when she went into the jails, she was more wary of the guards than the inmates, and as she started to describe the types of practices that are more appropriate to teach in jails, and the necessary modifications that the teacher must make, again that feeling came to me. The indescribable, sort of deep knowing I had when I first met Swami Mukti and then my guru Swami Niranjan. At that stage I knew immediately somewhere that I would do it. Of course. It was another thing I REALLY knew, like I knew to come to this far out ashram in the jungle of Bihar, without question. But I put it out of my mind for some time. A few years later upon returning to my ‘normal’ life in the West I viewed a documentary about an Australian Buddhist nun, Robina Williams who shares Buddhism in high security prisons in America and again that same knowing came. I thought ‘Yes, I will do this’. Again I put it out of my mind for some time. It wasn’t until 7 years later when I completed my Satyananda Yoga teachers Training Diploma, and arrived in the Waikato to take over an established Yoga centre, that I got the chance to approach Waikeria prison. From there on it was simply a matter of a phone call, an interview, induction and wham! – there I was suddenly standing in front of 80 male offenders to explain what Yoga was! It happened in a similar way to going to the ashram – easily and quickly! Almost as if there was another force at play. This time I wasn’t in over my head. But I certainly used one Yogic technique (Moolabhanda – a perineal lock) to ground myself and reduce any chance of fear rising. I stood my ground, steady and even and spoke to them all. I gave full eye contact and talked about all the aspects of Yoga. I didn’t censor my talk like I would in the normal community for fear of turning people off with all the weird ‘spiritual’ stuff, and when I mentioned the word spiritual I felt all 160 ears prick up! Then they asked me questions, and I was literally blown away by the things they were curious about! The type of questions they asked were questions I might expect from advanced Yoga students…or at least from people who had been practicing some form of meditation or self development for years! They seemed to understand from my short talk what Yoga really was, that it is more than a physical practice, that it is about balancing the physical, mental, emotional and spiritual aspects of the personality. And from there 25 men signed up as part of a voluntary weekly Yoga class. I taught these men for 3 months and it was a profoundly satisfying experience. They learned strong asana, simple breath awareness and Yogic breathing, and meditation as well as chanting of Sanskrit mantras. It was an ideal situation with a very supportive unit manager, and I felt truly blessed to have this opportunity to begin the dream. After that talk the guards who were with me at the time turned and said ‘ What were you doing? You were so calm!” They had never seen anything like it, so I told them to come to a yoga class and find out! I felt so energised during that first time of teaching at Waikeria, that it was a little curious at first, and then I realised it was because I was finally following my dharmic path. I knew this because the incredible surge of energy I got from going and leaving that weekly class surpassed anything I had ever experienced. I was so happy to be with these men, sharing the ancient techniques of Yoga, and the response I got from them was sincere and great. They recognized my intention was genuine and loving and this allowed grace to flow. My attitude was that of Seva (selfless service). They saw I wasn’t telling them they were wrong, or needed to change anything. I was allowing them to just ‘BE’ for perhaps the first time in their lives. Most of them were Maori or Polynesian men, and these people have a deep, cellular, spiritual memory and as I shared yoga with them it started awakening naturally. As soon as I said the words ‘now please close your eyes and become aware of your breath’ (such a simple thing) they became so still that I started. Beginners never sit as still as these men were sitting now! There’s usually some twitching, itching or fidgeting, or looking around at the others. Not these boys…they seemed to know, as I had back then that here was ‘something’ different. They recognized the deeper level of connection with the divine just by become still perhaps for the first time in their lives. For them, to breathe deeply and relax, also perhaps for the first time in their lives, was so utterly profound they showered me with heartfelt thanks and full respect at the end of each class. I would drive home not even touching the road! This was when I realised ‘Yes…this is how I am serving my Guru’. That energy was flowing from him to me when I first came to live with him in India and again I felt it flow strong when I was teaching these prisoners. This is the only way I know it is the right thing for me to be doing. The yoga practices have many benefits for the prisoners including release of pent up emotion (anger and sadness), increased calmness, balance, and better sleep. Physically it helps with sore backs, headaches, digestive problems and fatigue (depression). It is a valid form of rehabilitation that will soon hopefully be recognized, and implemented in all Corrections Dept. The ease and flow with which it happened tells me that divine grace is blessing me, and I must share this and let it flow to these people who have had unfortunate starts to their lives. Only through service to others can I feel that connection with the Divine. Big thanks to Adhyatma for sharing her story. If you’ve had an experience teaching yoga outside of the usual public class structure, The Yoga Lunchbox would love to hear your story. Thankyou, Prana Flow, for wonderful, inspiring articles. Many years ago, I used to take N.A. Meetings into Arohata prison…I was clean and sober, and really felt I was serving, in a good way-since, I have experienced deep depression, rabid active addiction, and wished I would go to jail, to experience the peace and safety of being in a cell. But, I have been practicing Yoga, in a group, twice weekly for the last couple of years, and it is my rock.It is the only time I feel connected, in my body, in the moment, and saying “yes” to life. I trust it will lead me to my true destiny-perhaps community living, an ashram, a kibbutz, its just something I feel! 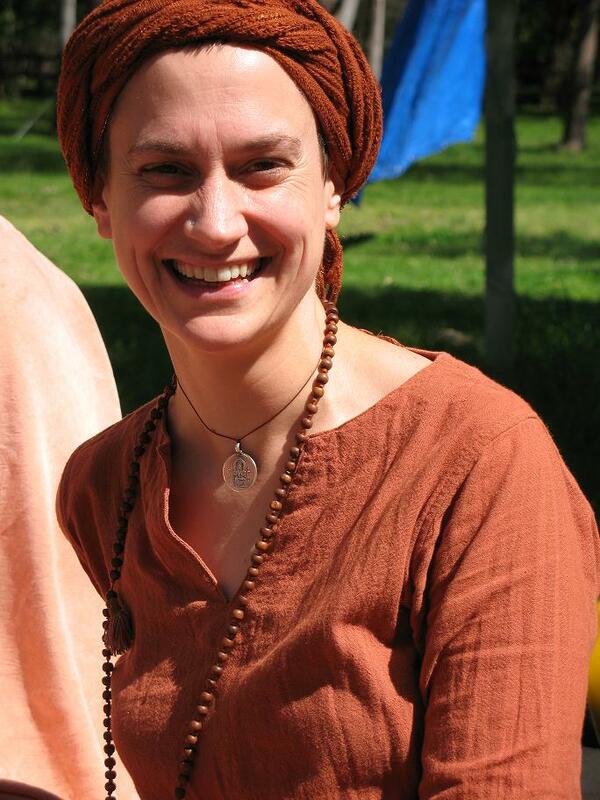 Adhyatma certainly has an inspiring story to tell – as do we all in many ways. Yoga especially does have so much to offer us, especially when life gets really tough. Keep practicing, and even consider starting to do a little bit at home by yourself. It’s amazing how much you can remember when you give it a go, and how good it makes you feel. This story was so beautifully and honestly told that it bought tears to my eyes. Thank-you.